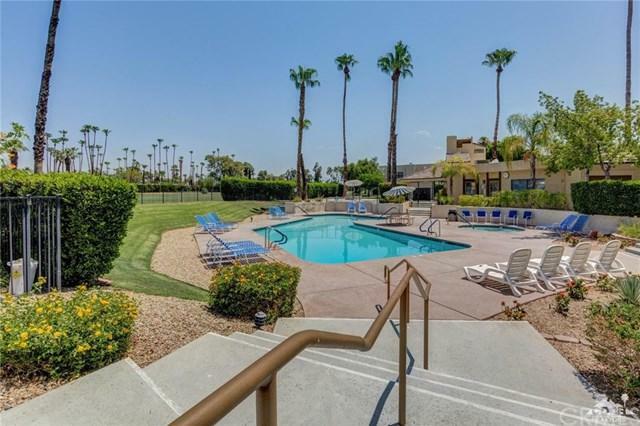 Palm Springs Golf & Tennis is a very popular community This is a very desirable upper level pool view condo. Conveniently located just steps from one of the 3 pools and surrounded by lush grounds. The condo is a 1 Bedroom & 1 1/2 bath with an area which can be used as a den or as a 2nd bedroom with a privacy screen. Kitchen has been updated with open configuration. Turnkey furnished. The condo has a private balcony overlooking the pool, beautiful landscaping & The community features 3 pools, 4 spas,4 tennis and pickle ball courts & a clubhouse/library. Easy walking to Trader Joes, Starbucks, Vons & restaurants around the neighborhood with great hiking nearby.Property is also adjacent to Tahquitz Creek public golf course. Downtown Palm Springs is a short drive away with more great shopping, dining, casino, museum & street fair. Just unpack your bags & enjoy. Sold by Bonnie Hungerford of Homesmart Professionals.